They are legendary as the ultimate 'shape shifters'. Despite their good publicity they remain much of a mystery. It is even quite hard to find them. They are easily overlooked since they are so transparent or not recognized as living organisms since they often resemble decaying organic remains. Some time ago I was asked if I could produce a series of images of microorganisms such as the Hydra, Paramecium and an Amoeba. I had to confess that I had never photographed an amoeba. So I tried to find out how to catch them. I read about the following method: Hold a jar upside down under water until it is situated just above the bottom of a pond. Then slowly tilt the jar to let the air escape. This way the top layer of the soil on the bottom of the pond will be sucked inside the jar. Many amoebas inhabit this top layer of decaying organic material. Two individuals of the giant Pelomyxa palustris, the biggest is almost 3 mm. When I examined the catch under the stereo-microscope it looked like nothing more than dirt but between it were some big gelatinous spheres. Then I noticed that they were slowly moving. I had hit the jackpot. I found the largest of them all. In this smelly pond 100 feet from my house lived giant amoebas! Pelomyxa palustris is the largest amoeba you can find in pond water. It inhabits the often oxygen poor mud on the bottom of ponds. They can become truly huge for a single celled organism. Some of them can be 5 millimetres, clearly visible with the naked eye! 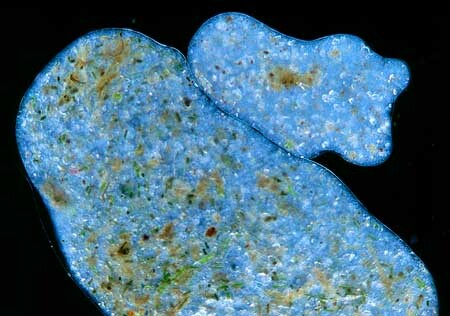 The top image of Amoeba proteus, gives a good insight in the amoeba's anatomy. Amoebas have a single cell that appears to be not much more than cytoplasm held together by a flexible cell wall. Floating in this cytoplasm all kinds of cell bodies can be found. The most obvious is the nucleus. Some species have only one nucleus, others may have hundreds of nuclei. The right image of a small individual of Pelomyxa shows it has hundreds of nuclei. This could enable them to become so big. When you find an amoeba it may be a complicated task to determine the species. Species may look very similar and the fact that they transform doesn't make it easier. But amoebas are not just 'blobs'. Each species has its distinct repertoire of shapes and appearance. Amoeba possess a kind of inner structure that defines their range of forms. The 'looks' of amoebas are a result of their so-called 'pseudopodia' (false feet) that come in several types. Some amoeba have many 'pseudopods' (polypodial), Others have only one (monopodial). Some groups have long extensions, almost like spines. Important clues for identification besides shape and size of the amoeba can be the shape and texture of the nucleus. The amount of nuclei can also be conclusive. A good example of how difficult identifying a species may be is Amoeba proteus. 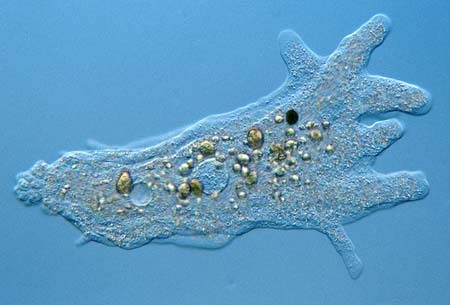 This attractive amoeba can be regarded as the 'prototype' amoeba. It is a relatively large species (sometimes more than half a millimetre) with a quite distinct appearance. But it is very easy to confuse this species for a very similar looking amoeba called Chaos carolinensis. (Which is in fact a more common species). Chaos differs because it has many nuclei while Amoeba proteus has one single nucleus. That is to say, most of the time. 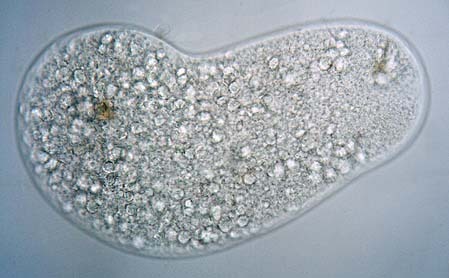 To make it more complicated, in some cases Amoeba proteus can be found with several nuclei. If you observe their lifestyle you will find that amoebas are really sophisticated. The way amoebas locomote as well as feed is really puzzling. The following page shows the intriguing way they catch prey.